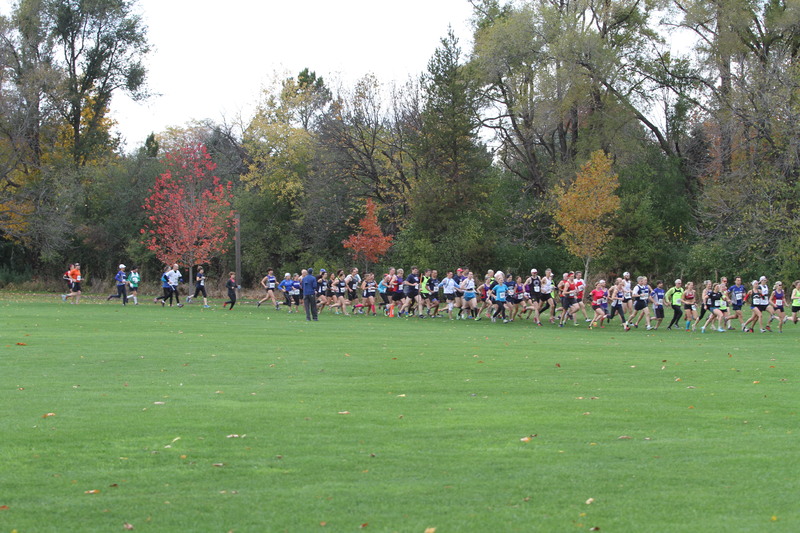 Muskoka Algonquin Runners had a historic weekend in Kingston at the Canadian Cross Country Championships. 27 runners represented the club, making us one of the largest clubs present. There were too many highlights to mention them all. Having a large team was a wonderful experience and we hope to build on this as we head into winter. We hope to see some runners take some chances by trying indoor track! It’s like going to the Bahamas (it’s warm indoors!) without the cost! Leading the way on Saturday was the ageless Bob Wild, who placed first in the men’s 80-84 category. Lia Kutzscher, Kim Russel-Brooks, and Chris Watson all placed 4th in their age groups. Troy Cox and Nancy Edson both placed 5th in their age groups. Our women’s 40-49 team surprised everyone with a Gold Medal performance! Congratulations to Tina Steele, Jennifer Nicholson and Tannis Wetlauffer! The women’s 50-59 team of Lia Kutzscher, Kim Russel-Brooks and Nancy Edson missed Gold by a cumulative time of 8 seconds! What a performance! Our men’s 40-49 team placed four men in the top 30 with Troy Cox (8th), Chris Watson (16th), Mark Sinnige (27th) and Pierre Mikhail (29th). The team placed second overall in the men’s 40-49 race, falling to a dominant performance by the Newmarket Huskies who had 3 runners in the top 10! Newmarket smartly raced their top 50-59 year old runner down an age group. The ageless Geoff Peat pushed that team over the hump (he was 10th) after being defeated by MARS all season. MARS was deep in men’s 40-49 with a second team of Tony Marra, Lowel Greib and Dave Johnstone also performing very well. Katherine Ahokas, Jess Sheppard, Mary Unsworth and Darla Coles battled the fastest runners in Canada in the Senior Women’s race, as did Josh Stevens and Kip Arlidge in the Senior Men’s race. Congratulations to these intrepid racers! MARSians represented all over Ontario yesterday! At The Hamilton Road 2 Hope Marathon, MARSian Rebecca Francis ran a Boston Marathon qualifying standard of 3:34:20 and was the second place woman in her age category. Lia Kutzsher also completed the race with a Boston qualifying time and was third in her age group, only a few months after racing Ironman Muskoka. Sharon Bennett, though injured battled her way to a marathon finish. Congrats to these intrepid MARSians. In Toronto, MARS took park in the third race in the Ontario Masters XC Series at the Sunnybrook 8K. Leading the way were the men’s 40-49 team of Troy Cox, Chris Watson, Pierre Mikhail and Tony Marra. The team is 2/2 this season winning both series races they have competed in. In addition, MARS had 2nd place finish in the women’s 30-39, and 3rd place finishes in women’s 40-49 and 50-59.